Have you ever wondered about William Vincent Wallace, who lived in the house adjacent to the parish office in Thurles, the building now occupied by the florist, ‘Annie Blooms’? 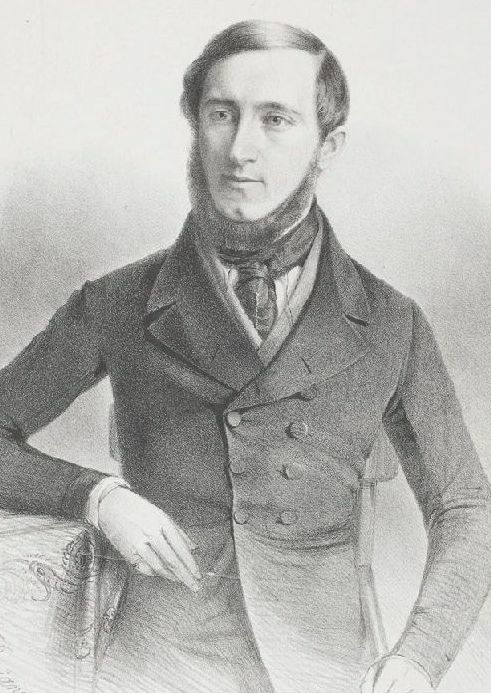 Celebrated Irish composer William Vincent Wallace (1812–1865) also lived for some years in Australia and, together with his extended family, made a valued contribution to musical life in Australia. 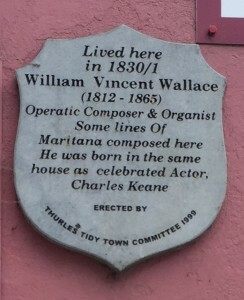 William was born in 1812 at Waterford City, the son of Spencer Wallace (1789-1846) and his first wife, Eliza (née McKenna), both fine musicians. Stated to be from Kilmoremoy, near Ballina, Co Mayo, Spencer was originally a musician in the North Mayo Regiment of Militia, graduating to bandmaster of the 29th Regiment of Foot. Spencer’s two sons, William (b.1812) and Spencer Wellington (b.1814) enlisted in the regiment in 1825, but when the regiment was posted to Mauritius in 1826, Spencer bought himself and sons out of the army. The family then moved to Dublin where they worked as musicians in the city’s theatres, William working as a violinist and conductor with the orchestra of the Theatre Royal. 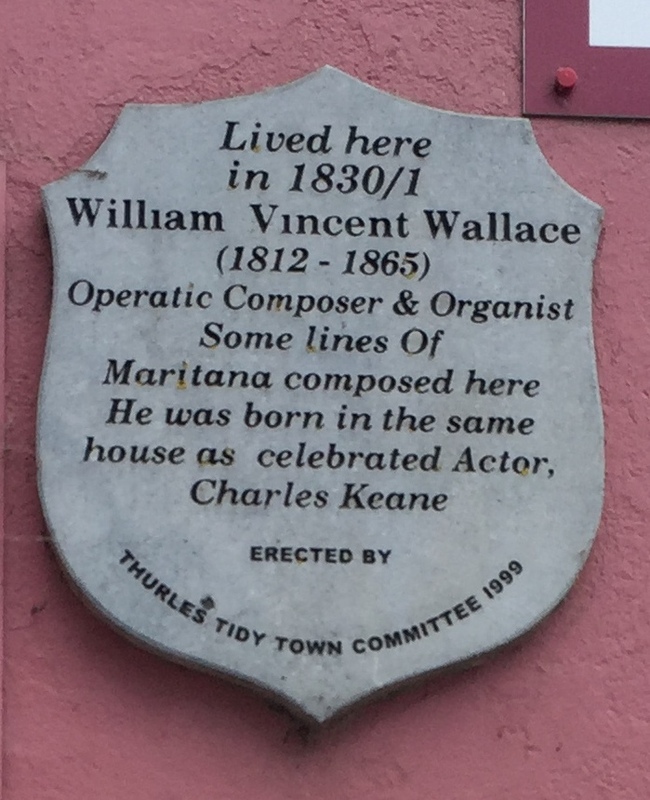 In 1830 William was offered the posts of Organist of Thurles Cathedral and Professor of Music at the nearby Ursuline Convent where his talented younger sister, Eliza was a student. Although some records state that William’s future wife, Isabella Kelly (c.1813-1900) was also among the boarders at the convent, it seems more likely that William and Isabella met when he was teaching music to Isabella and her sisters, daughters of David Kelly of Frascati, Blackrock, Co Dublin. William fell in love with Isabella and converted to Catholicism in order to marry her, several sources stating that he assumed the middle name of Vincent at his conversion. In August 1831 William accepted the offer of sub-leader of the Dublin Theatre Royal Orchestra and took part in Paganini’s concerts at the Theatre Royal in September 1831. In February 1832 William and Isabella married in Dublin and moved into No. 11 South William Street. Two years later their only son, William (‘Willy’) was born and shortly afterwards, William became Deputy Leader of the Theatre Royal Orchestra. In May 1834 he played a Violin Concerto of his own composition at a Dublin Anacreontic Concert, gaining recognition as a serious composer. Meanwhile, Wallace’s mother had died, his father had remarried, and the extended family was intent on seeking a new life in Australia. William, Isabella and their son, Willy, sailed first, embarking from Liverpool in July 1835 on the Rachel, disembarking at Hobart on 31 October 1835. Their stay in Hobart was short, as on 2 January 1836 they sailed to Sydney. They moved to Parramatta and William gave his first concert at the Royal Hotel on 12 February 1836, the concert was repeated two weeks later due to demand. These were the first of over twenty popular concerts given by William and his extended family over the next two years, many under the patronage of the Governor of New South Wales, fellow Irishman, Sir Richard Bourke. In October 1835 William’s father and siblings had departed Cork on the James Pattison, arriving at Sydney on 7 February 1836 just in time to join William at his first concert. On the shipping list, Spencer Wallace was stated to be a 41 year-old Professor of Music. He and his second wife, 28 year-old Matilda (née Sargeson), emigrated with two children: Spencer Wellington (known as S.W.) aged 21 from Spencer’s first marriage, and an unnamed baby daughter from his second marriage. They were accompanied by two women travelling on the single female bounty: Spencer’s daughter from his first marriage, Eliza (Elizabeth) Wallace, stated to be a 16 year-old actress, and Charlotte Kelly (Isabella Wallace’s sister), stated to a 25 year-old governess and usually referred to as ‘Miss Kelly’. It was not unusual for well-connected Irish women to avail themselves of the female bounty or for their families to accompany them on the female emigrant ships. The Wallace family was just one of many middle-class families to avail themselves of the best opportunity to migrate, and they used the hook of the female bounty as the means of migrating. On Wednesday 17 February 1836 the extended Wallace family moved out of the lodgings provided by the government for the arrival of the passengers by the James Pattison. A week later, on 25 February Charlotte married James Cromarty, the captain of the James Pattison at Scots Presbyterian church, the marriage conducted by Rev. Dr John Dunmore Lang, a notice being placed in Lang’s newspaper The Colonist on 3 March 1836. By 4 April 1836, the family had opened the colony’s first ever music academy at Bridge Street, Sydney and continued to give well-received concerts in New South Wales. On 1 June 1836, Sydney merchant, A.B. Spark, noted in his diary, ‘Attended Mr Wallace’s concert in the Saloon of the Royal Hotel. Such execution on the Piano and Fiddle I had never heard before. The Governor and his suite were present and most of the magnates of the land’. Another entry in Sparks diary for 4 August 1836 reads: ‘A Musical party at Government House … Mrs Plunkett presided at the Piano, and Mr Wallace astonished us with his violin’. Another highlight was an oratorio concert at St Mary’s Catholic Church on 31 January 1838 (postponed from 26 January), for the fiftieth anniversary of the foundation of the colony. At this concert, the 18 year-old Eliza Wallace and her husband-to-be, John Bushelle, assistant choirmaster at St Mary’s, sang an affecting duet together. Within a fortnight of the concert, and without warning, William departed the colony. Isabella and young Willy had already returned to Ireland as it seems that by this stage, the marriage had broken down. On 1 May 1839, Eliza successfully applied to the governor to marry the colourful and talented bass singer James (alias John) Bushelle (Buchelle). As a convict, Bushelle required the permission of the governor to marry. They wasted no time, marrying nine days later at St Mary’s, Rev. Francis Murphy performing the ceremony. The witnesses were Charles Henry Chambers and Sarah Cooper, both of Sydney, significantly not any of her family. Aged 34 at the time of his marriage and known as the ‘Knave of Diamonds’, Bushell had been transported for fraud, following his impersonation of a Prussian baron. He arrived in New South Wales per Phoenix in 1828 and at the time of his marriage held a ticket of leave. After her marriage Eliza organised several successful concerts, including one held in September 1839 at the Theatre Royal, when she was ‘assisted by M. and Madame Gautrot; Mr Deane and family, Mr S.W. Wallace [her brother], Mr H. Leggatt and all the Theatrical Band and Mr Bushelle [her husband]’. She was again assisted by the Deane family at a concert at Maitland in June 1840 and another in October the following year at Parramatta. Of her concert on 26 March 1841, the Sydney Herald reported that ‘Mrs Bushelle in fine voice … Mr Bushelle was in all his glory’. In 1840 twin sons were born and three years later, when she was five months pregnant with her third son, her husband died during a concert tour of Van Diemen’s Land. Bushelle was aged only 27, and left Eliza a widow at the age of only 23. Known professionally as Madame Bouchelle (or Mme Wallace Bushelle), she became a well-known singer in her own right and in 1844 was listed as a ‘Professor of Music’ living at 213 Castlereagh Street, Sydney. Following a series of farewell concerts in Sydney in the spring of 1847, and leaving her sons with her father, she left Australia to further her professional career. 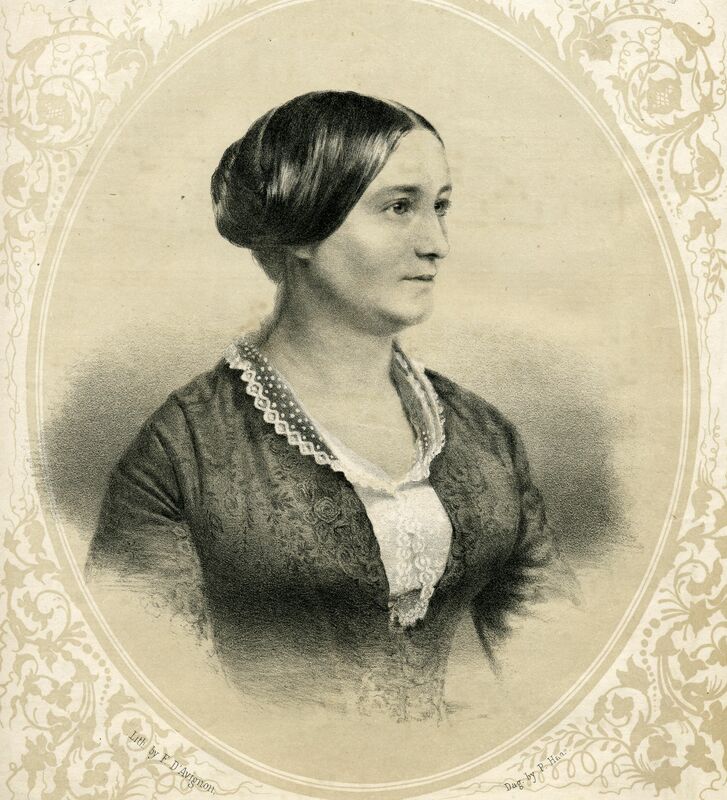 She was invited by Mendelssohn to sing in the ‘Elijah’ at Vienna. The high-point of her career was perhaps singing the title role in ‘Maritana’ (composed by her brother, William) when the opera was first performed at London’s Covent Garden in 1848, after which she participated with her brother William in many concerts in the USA. She returned to Sydney and settled down at Darlinghurst as a noted singing teacher. She died there, aged 58, on 16 August 1878, at her residence in William Street, Darlinghurst, her contribution to the cultural life of Australia all but forgotten. Eliza’s father, Spencer, and his wife Matilda continued living at Parramatta. They had two sons in Australia but his library business did not thrive. He applied for insolvency during the great recession in the early 1840s. In 1844 Spencer successfully applied to Governor Gipps requesting that Matilda be admitted into lunatic asylum. He stated that he was not able to pay for the care of his wife in the asylum as he was supporting five children and ‘myself on 15 shillings per week which I receive from the Victoria Theatre. I have been left in this melancholy position though suffering from paralysis for the last ten months, in consequence of which, I was left unable to exert myself in my profession, as teacher of music’. Spencer died, aged 57, in 1846; his wife died at Parramatta in 1869, aged 55 years. Following his sudden departure from New South Wales in 1838, William travelled to New Zealand, South America and Mexico before staying for some time in New York. He arrived in London in 1845, enjoying success with his opera ‘Maritana’ in England and Europe. In 1850 he sailed for Rio Janeiro, before returning to New York and finally London. During these years, he composed several works, including his popular opera ‘Lurline’ and was accompanied by his devoted partner, the pianist Helene Stoepel, who became the mother of their two young sons, Clarence and Vincent. Never in strong health, in 1864 William and his family moved to Paris, where the composer Rossini was an almost daily visitor. The family then moved to a chateau in the Pyrenees, in the south of France belonging to Helene’s brother in law, Baron Henri de Saintegeme. William died there on 12 October 1865, aged only 53, tended by his family and nephew, John Bushelle (Eliza’s son). In writing this blog, I am very grateful for advice received from Dr David Grant. See also David Grant, ‘William Vincent Wallace and Music in Australia 1835-8’ in Laurence M. Geary and Andrew J. McCarthy (eds), Ireland, Australia and New Zealand, History, Politics and Culture, Irish Academic Press, Dublin, 2008; Elizabeth Rushen, Colonial Duchesses: the migration of Irish women to New South Wales before the Great Famine, Sydney, 2014; Perceval Graves’ unpublished typescript memoir of William Vincent Wallace (c.1943), W.H. Grattan Flood, William Vincent Wallace: A Memoir, Waterford, 1912; The Colonist, 18 February 1836 and 3 March 1836; Empire, 4 December 1987; The National Archives, Kew, List of female passengers, James Pattison, CO 384/39, pp.192-197; A.B. Spark, Diary 1836-1856, Mitchell Library, State Library of NSW, FM4/1068; State Records NSW, MLA1216, COD 425, pp.269-291 and 4/2650.5 44/3517.